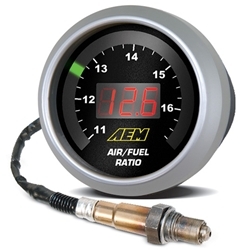 AEM's digital wideband air/fuel ratio gauges utilize a universal exhaust gas oxygen (UEGO) sensor to accurately monitor air/fuel ratios (AFR) during the tuning process. This gauge features a digital LED display and sweeping LED "needle" that changes colors as the air/fuel ratio changes from rich to lean. The unit's 52mm (2-1/16") gauge housing fits in most gauge pods and can be remotely mounted virtually anywhere.